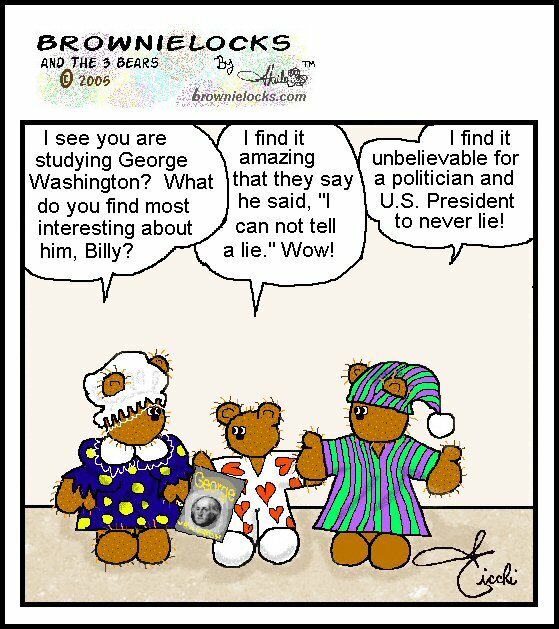 President's Day = Washington & Lincoln's Birthday History + Cartoon Fun! President's Day combines both Washington's birthday and Lincoln's birthday, since both happen in the month of February very close together. Why was this done? In 1968, congress (Legislation # 15951) passed a bill that changed several federal holidays, in order for them to fall on a Monday, thus creating a 3-day weekend. The act took affect 3 years later in 1971. One of the holidays that was affected was Washington's Birthday, which got shifted to the third Monday in February every year, whether it was the 22nd (which is really his birthday) or not. (I'll get to the specifics of each of these birthdays in a second. ) Some calendars still print both Washington's Birthday and Lincoln's Birthday on them. Some print "President's Day" on the third Monday in February. However, the third Monday in February is still "officially" Washington's Birthday. Why? Technically, no President or Congress has ever legally changed the name of the third Monday in February to be designated as "President's Day." (Well, not yet) However, socially it has become known as "President's Day" to not only honor both President George Washington's birthday and Abraham Lincoln's birthday, but to pay respect and acknowledge all the other men who have served as our presidents. Usually only federal employees (and companies connected with them) take the day off as a holiday. President's Day today has mostly turned into a commercial event where stores take advantage of the holiday weekend and have sales to empty out their shelves of midwinter stock. George Washington was born on February 22, 1732. He became the first president of the United States in 1789 (and re-elected in 1792). They also made him the commander-in-chief of the Continental Army during the American Revolution. He has always been an important figure in American history and literature. And, some say even a legend in his own time because people were celebrating his birthday while he was still alive! But, the celebrations were usually held on February 11. The date wasn't shifted to February 22 until 1796 when the New Style or Gregorian calendar was adopted. The first town to sponsor a public celebration of George Washington's birthday was Richmond, Virginia in 1782 (even before he was president). Celebrations became more popular during his first term in office, but then faded off with the development of the two political parties, then called the Federalists (Washington was sympathetic towards this side) and the Jeffersonian Democratic-Republicans (who thought celebrations like this were offensive). These partisan feelings remained until Washington died in 1799. Congress then passed a resolution calling on the nation to observe February 22, 1800 with appropriate activities. But, law or not, the observance of Washington's Birthday didn't really catch on until 1832, 100 years after his birth! The most publicized celebration happened in 1850. In Los Angeles, CA a fancy ball was put on by some of the town's most prominent residents in honor of Washington's birthday. However, this meant that some of LA's lesser citizens were not invited, which angered them a lot. So, they retaliated by firing a canon into the ballroom, which resulted in several men being killed and wounding many others. I have to briefly mention the story of George Washington chopping down the cherry tree and then proclaiming, "I cannot tell a lie" admitting he did it. Well, the story can't be authenticated. The story first appeared in the 1806 edition of The Life and Memorable Actions of George Washington by Parson Mason Weems. But, this cherry tree and the hatchet that he supposedly used, today are a symbol of the honesty and forthrightness that George Washington was admired for. Another tale is that he threw a silver dollar across the Potomac River (why I'm not sure). Information about the Washington Monument can be found on our Patriotic Symbols page. As I stated above, President's Day has turned into a commercial day. So these legends are used also for sales slogans like "We're chopping our prices" or "Silver Dollar Days." Abraham Lincoln was born on February 12, 1809. He was the 16th president of the United States. At the age of 25, he was elected to the Illinois State Legislature. In 1837 he became a lawyer and moved from New Salem, Illinois to Springfield, Illinois. It was there he met and married, Mary Todd in 1842. From 1847 to 1849 he was a member of the U.S. House of Representatives. Then he left politics and returned to his law practice in Illinois. For whatever his reasons, he got back into politics, but lost in his race for U.S. Senate in 1858 to Stephan A. Douglas. But, although he lost this election, Lincoln impressed the public during the campaign with his speaking while participating in a series of debates against Douglas. So, in 1860 he was nominated at the Republican Convention for the presidency. In November he won! It's pretty common knowledge that Lincoln was totally against slavery. He felt that the government wouldn't stand a chance if half the country allowed it while the other half didn't. Less than 6 weeks after Abraham Lincoln was inaugurated as President of the United States, the Civil War began (1861-1865). Although his priority was to keep the nation whole, Lincoln realized this wasn't going to happen as long as slavery continued. So, he issued his famous Emancipation Proclamation, which freed as of January 1, 1863, 5 million slaves. On November 1864, Lincoln won a second term as president. But, on April 15, 1865 (six days after General Robert E. Lee surrendered at Appomattox ending the Civil War) President Lincoln was shot by John Wilkes Booth while he and his wife watched a performance at the Ford's Theatre in Washington, D.C.
After President Lincoln's death, a funeral train carried his body for two weeks throughout the country. Crowds gathered at every station to pay tribute. Today, feelings still remain strong for him, as expressed in the number of books, plays, poems and movies written about him. In 14 states, February 12 (Lincoln's Birthday) is actually a legal holiday, while others will observe it on the 2nd Monday in February. And yet other states will combine it with George Washington's Birthday (on February 22) and observe it also on the 3rd Monday in February as President's Day or, Washington-Lincoln Day. However, in Springfield, Illinois, a special observance is held where American Legion, Veterans of Foreign Wars, and members of other patriotic groups make an annual pilgrimage to his tomb. Race Relations Sunday is also celebrated on the Sunday nearest February 12. Commemorating the role Lincoln played in freeing the slaves, this occasion is observed by Roman Catholic and Jewish, Protestant and Eastern Orthodox churches. The Gettysburg Address is the most famous of Lincoln's speeches. It was delivered a year after the Emancipation Proclamation, at the dedication of the national cemetery at the Gettysburg battlefield (I've been there a few times). This poignant and inspiring speech has been praised all over the world as an example of beautifully written English prose, even though Lincoln had not time to prepare it and spoke from a few notes scribbled on a piece of paper. It begins with the infamous words..."Four score and seven years ago our fathers brought forth upon this continent a new nation conceived in liberty and dedicated tot he proposition that all men are created equal." The Lincoln Memorial in Washington, D.C. was designed by New York architect Henry Bacon in classic Greek style. The statue inside, however, with Lincoln sitting on a chair was designed by sculptor Daniel Chester French. The memorial is located at the end of the reflecting pool was dedicated on Memorial Day 1922. More about the Lincoln Memorial is on our Patriotic Symbols page. One of the most popular commemorations of Lincoln's Birthday takes place at his Memorial, where government officials and foreign diplomats led by the president of the United States or his representative, gather at noon to place wreaths before the massive statue of Lincoln. The president usually issues a Lincoln's Birthday Address focusing on the nation's accomplishments and shortcomings in the area of race relations and civil rights. Return to our Holidays page. Our midi is "Hail To The Chief"